Icons are one of the design components you can't do without. Sometimes good mobile specific icon sets can be hard to find so here is my list of 11 free mobile icon packs I find particularly useful. There are many more I didn't include in this article but these make a good collection for every designer's tool box. No matter which mobile operating system you are designing for, you will always need some basic images of phones and other mobile devices. This icon pack contains plenty. It's a general vector pack with icons of phones (mobile and fixed-line), tablets, handsets, and other items related to mobile calls and mobile use. The icons are black and white but since it's a vector pack, you can always add more color and/or change icons sizes if you want to. If you need more phone icons and you prefer them flat, check these flat phone icons. This assorted pack contains about 200 flat icons of phones and other mobile-related items. Again, the pack is black and white but it's vector based, so it is not hard to change the colors and/or the size of the icons. You can download either the entire pack, or only the icons you need. This huge megapack of 10,000 icons for Android, iPhone, iOS7, and Windows8 is probably one of the best resources you can find online and it's free for both personal and commercial use. When you download this, all the other packs might become useless because this contains a lot of useful icons. The 10,000 icons for iPhone, Android, Windows8 and iOS app styles come in multiple sizes, such as 20×20, 30×30, 60×60, 114×114, 512×512 and more. They also come with add-ons and the source files. No doubt, this is one megapack every mobile designer should have. 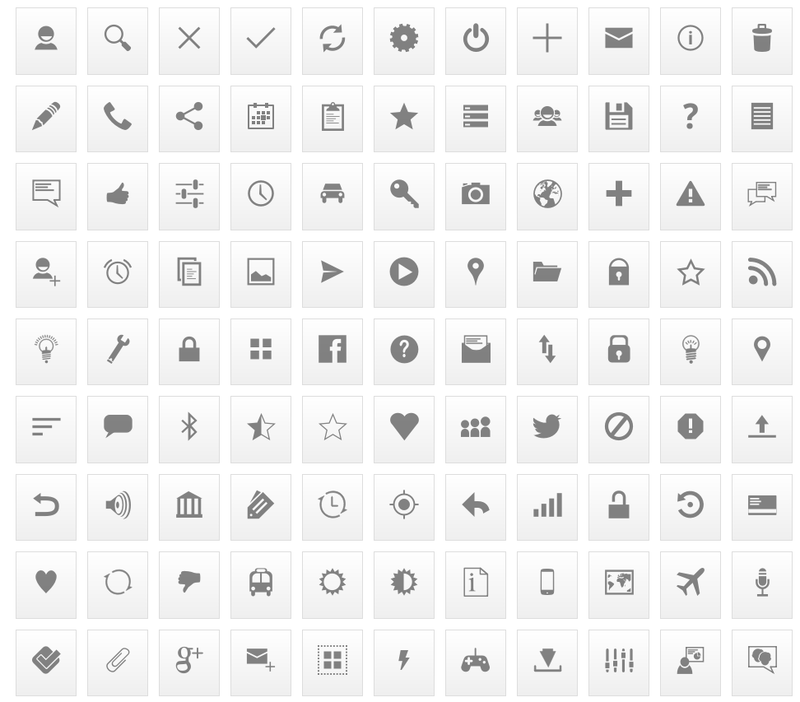 Besides this free bundle, the authors offer a paid version with more than 80,000 icons. Compared to the previous pack, this icon set isn't as impressive but still it has good Android icons you can use in your personal and commercial projects. This is a pack of mixed Android icons – icons of devices, common objects, basic UI elements, etc. This isn't the only icon pack on this site. There are many other Android packs, such as network icons, photo and video, flat UI, shopping, etc. If you need icons for a specific topic, just browse the site to see what else is available. This icon set is also for Android but the icons are different from other packs. This is a relatively small pack of about 30 icons but it's useful because it contains icons of popular apps and sites as well as settings, voice search, etc. Unlike the previous pack, the icons are full color but the disadvantage is that they are only in PNG format, no vectors included which limits your editing options. 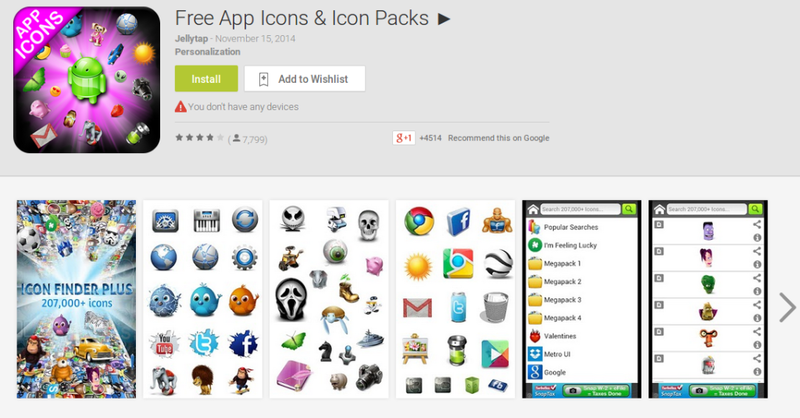 One more pack of assorted icons for Android. This pack is large – it has 350 icons in it, grouped in several categories, such as Basic, Buzz, Arrows, Shopping, Photo and Video, Music, Users, etc. The icons are not in color but they are available in multiple formats, such as PSD, AI, EPS, SVG, and PNG, so editing them to add color or make other modifications is easy. By default the icons come in multiple sizes – from 24px to 512px but again, you can change this if necessary. Unlike the other icon packs for Android, this one is not for developers but for end-users. This is a pack you can use to substitute original Android icons with. However, since the pack is huge – 207,000 (yes, thousand) icons, chances are an Android designer will find quite a lot to use – if not directly, at least for inspiration. Not all the icons are free, especially for commercial use, so before you use them, check the license. If you want some icons from Google itself, you may want to check this pack of action bar icons. To download the pack, click here. The icons in the pack are optimized for multiple screen resolutions and work best with Holo Light and Holo Dark themes. There are about 150 icons in the pack for common actions, such as core activities (copy, paste, edit, etc. ), navigation, ratings, collection, content, social, location, camera, media, device access, hardware, alerts, and extra actions. The icons are PNG, which isn't as nice as vectors because of the limited editing options PNG offers but still this doesn't make the pack useless. After the series of Android icons, now it's time for iOS. The first pack of iOS icons is this free pack of iOS7 line icons. The pack contains 80 icons in AI, PSD, SVG and PNG (and PNG@2x) formats. The icons cover multiple categories – from calls, to photo, music and navigation. The pack is mostly iOS7 icons but there are a few iOS8 icons included. The pack is free but you need to enter your email to get the download link. If you are looking for iOS7 tab bar icons, check this set. The package contains 36 iOS7 tab bar icons in PSD format. Among other things, you will find icons for Inbox, Copy, Trash, Logout, Settings, Locked, etc. This is a basic package but if you don't need more than this, you will be fine with what's inside. This is the second megapack on this list and this pack includes icons for Android, iOS, and Windows. It's huge with over 175K icons in PNG and PSD formats. It comes with several add-ons as well. The icons are in categories such as General, Accounting, Business, Database, Education, Graphics, Multimedia, Networking, and Web Design. This pack comes with multiple licensing schemes, including a free one. I am not sure if the free option includes all the 175K icons available but if you need them all, you can get them for $35. If you prefer to go with the free option you will need to subscribe to the site's newsletter or share it on social sites. This isn't much to ask, considering how many icons for all mobile OSes you get. Your app or site might be packed with functionality but without some quality icons, it might not get noticed at all. Even if you can't design all the icons on your own, there are a lot of alternatives, including free ones. Some of the best icon sets for Android, iOS, iPhone, and Windows8 are free and I've included them in this article. Of course, there are many others that didn't make the list, if you have any other suggestions we'd love to hear them in the comments below.